ummm... i don't really do flats unless the are flat boots... but these are fuckN killer! Genuine lambskin? Ahhhh :( if you had a vegan style that'd be nice. ok just let me die in a corner... I need some flat shoes for the summer, they will be fierce and perfect. But, will you sell it in pink like in your trip pics? These will literally be the only flats I'll have worn (except combat boots) within 3 years. 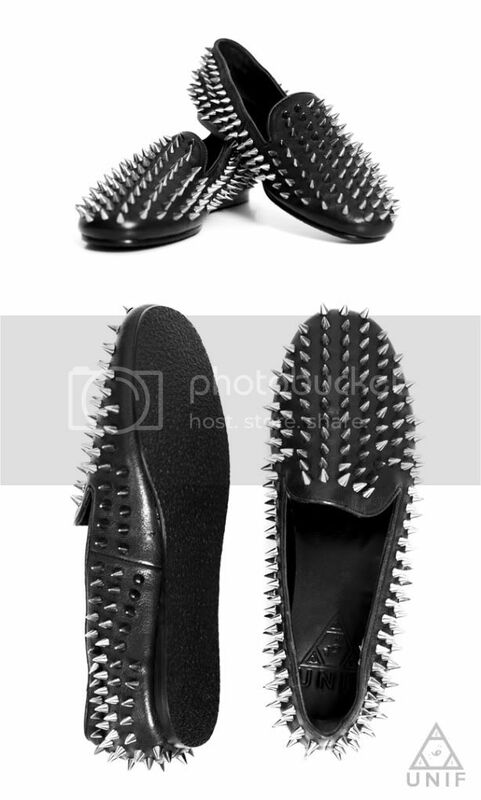 When I lived in Paris, I would always see this man wearing spiked loafers similar to these and I was so in love. Needless to say, I am so grateful for UNIF. I want I need!!!! !Hope there an online retailer that ships to Canada!!!! goddamn please dont be outrageously expensive so i can afford these bad boys. I'm with everyone else on this, I am actually craving these flats. That's a first in a reeeeeeally long time. been wanting a pair like this since foreverrr, i hope they aren't too expensive so i can afford them with my birthday money ! Talk about deadly weapons! I absolutely love them. Well done! They are already gone on solestruck :(((. sobb where can I get them!! I want them in pink and black soooooo bad!!! Dying for these. I hope I win on twitter lol. wow, that's harsh. In a good way! Where can we buy them? And are they big or small size? Is there nowhere I can buy these online? I live in Denmark and I am dying for these. really wanted a pair of these but theyre sold out :( saw a guy earlier with these shoes and i wanted to grab them off of his feet. hahahhaha! those shorts are amazing! I WANT THEM!! Oh. My. Goodness! These shoes are absolutely ace! They are crazy, edgy, punky, and 100% gorgeous. Best shoes I have seen today! I got to have these!